Photo by Karen Schaack. 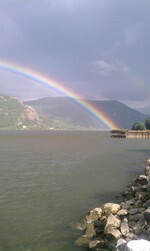 Rainbow at the river. What a great photo! I can't believe how clear the rainbow is. Very cool.